Madrid is one of the most beautiful cities I’ve ever seen after Seville, of course. Madrid is one of those cities which is lovely at any time of the year. Doesn’t matter if you are visiting Madrid in Spring or in Winter. There are a lot of places to visit in Madrid in 3 days. This city is amazing even just for a weekend, but the best will be if you plan a spring break in Madrid. In fact, you are planning a Madrid itinerary 3 days, the best time of the year is spring. The weather is just lovely, as it is not too hot and you can enjoy the city even better. 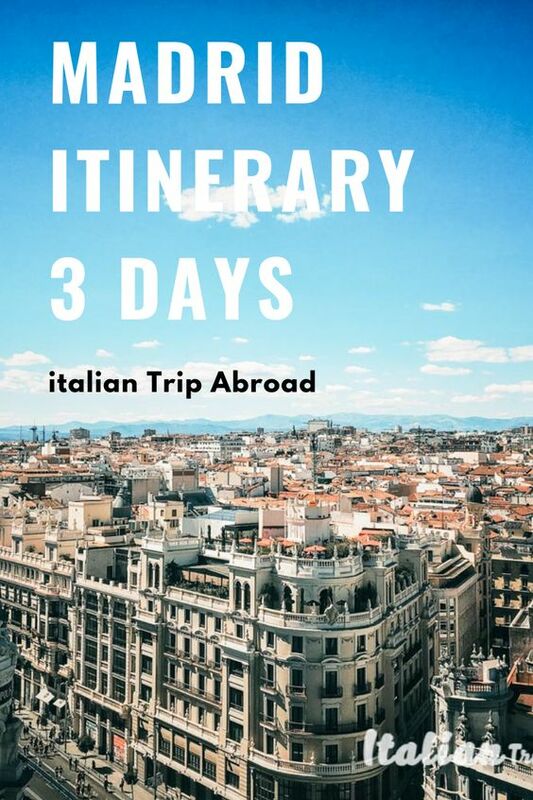 In this guide, we will help you to organize the perfect Madrid 3 days itinerary. An overall plan about what to see in Madrid and which are the best sightseeing. 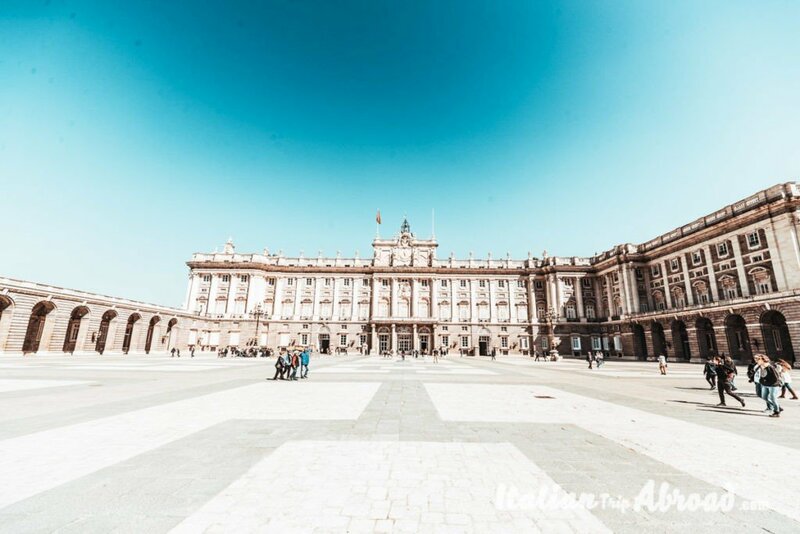 In your Madrid itinerary 3 days, of course, you can’t miss visiting the Royal Palace. It’s even the perfect monument for your first shot in Madrid. Start to fill your Instagram profile with the photos of Madrid from here. The Royal Palace is for us one of the best photo spots in Madrid. The Royal Palace opening hours are pretty easy to remember. It’s open every day from 10 am until 8 pm. In your list of what to do in Madrid for 3 days, try to find the space to visit the interior of Royal Palace. You will not regret the visit. This is the main square of Madrid, and when the locals refer to the square they are meaning at it. This famous square is located a few blocks away from Puerta del Sol. One of the best things about the Plaza Mayor is the surrounded atmosphere. If you think to visit Madrid in 3 days is not possible, believe it or not, it can be done. Take this square as a landmark, a point of reference where start to plan your itinerary for the 3 days in Madrid. Really close to Plaza Mayor there is another amazing landmark. Puerta del Sol is one of the busiest squares in the city. It’s’ also a beautiful piazza. Do you know about the New Years eve legend? So, here in Puerta del Sol, there is a clock, where the people, during the last few hours of the year love to meet and wish the best for the next upcoming year. You need to eat a grape with each bell strike at midnight. To reach Puerta del Sol is really easy. Take the metro line 1,2 and 3, or by bus 3,51, N169, N26 stop at Sol. In your itinerary of what to do in Madrid in 3 days, Puerta del Sol need to be on the top of the list. You can compare this museum to the Louvre. The Del Prado Museum it’s one of the main things to do in Madrid. You will end up spending the whole day as it’s a beautiful museum. Is the perfect place for everyone who loves art. To be honest, Alessia doesn’t really like museums but this one was particular and just stunning. This is not the only museum to visit in Madrid. If your plan is to fill your holidays and your short time in Madrid with Art, you have to see other museums. We suggest visiting the Museo Nacional Centro de Arte Reina Sofia. It’s a Spanish national Museum. It is open every day from 10 am till 8 pm and the only day which is closed is on Tuesday. This is one of the best things to see in your Madrid spring break guide. The famous Real Madrid stadium. It is located not far from the city centre. 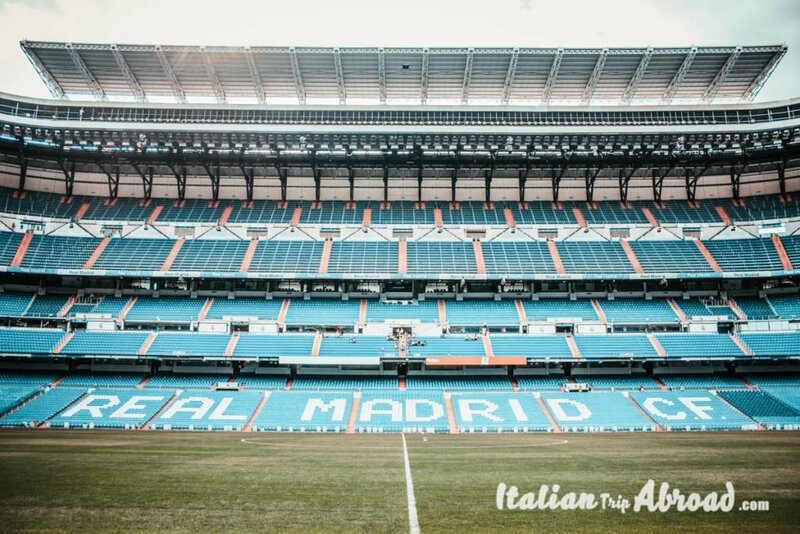 If you are visiting Madrid at the right moment, maybe you will have the opportunity to enjoy a live game. If you are less fortunate, you can opt for a complete tour of the stadium. The locker rooms and the press room. The tour never seems to end, there is the whole story of the players and coaches who made this club great. You can also admire all the cups won by Real. Those are a lot. At the end of this splendid journey, you will find yourself in the official shop of Real Madrid, where you can buy souvenirs. Time to relax in Madrid. Just crazy, insane shopping and souvenirs.The perfect spring break in Madrid can be even more relaxing if you do some shopping in one of the famous streets, Gran Via. This main shopping street of Madrid is comparable with Oxford Street in London or the Avenue des Champs-Elysees in Paris. This is the perfect place for all woman but, if you are with your partner, there are a lot of coffee shop where they can wait while you do your shopping. The closest tube is Callao, line 3 and 5. If you are already in Gran Via it would be even more easy to reach Puerta de Alcalá. It’s the perfect photo spot in Madrid. Did I tell you how much is Instagrammable Madrid? I don’t think I did enough. Anyway, Puerta de Alcalá is an emblematic monument in Madrid and the most famous landmark. This triumphal arch is situated in Plaza de Independencia, really close to El Retiro main entrance. 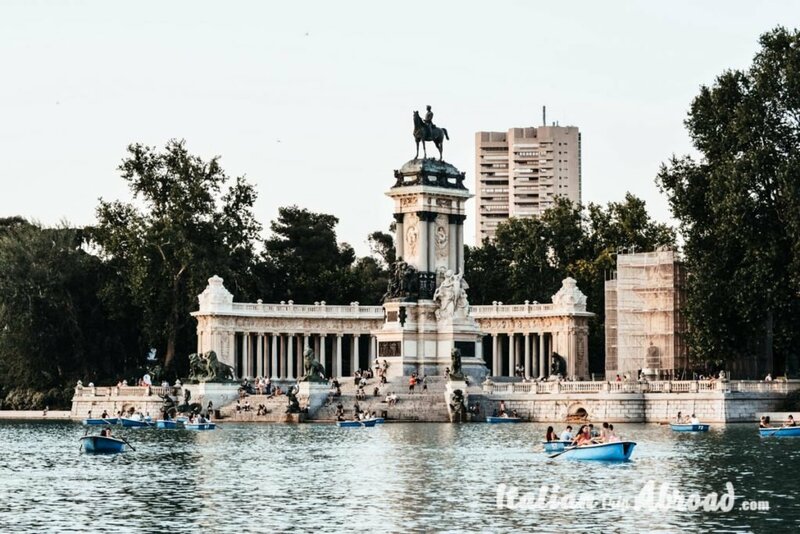 Close to Puerta de Alcalá, there is a huge park, whose name is Retiro park and just in the middle, there is Palacio de Cristal. So be ready to snap again. Retiro Park is really nice, but the Palacio de Cristal is the real attraction. 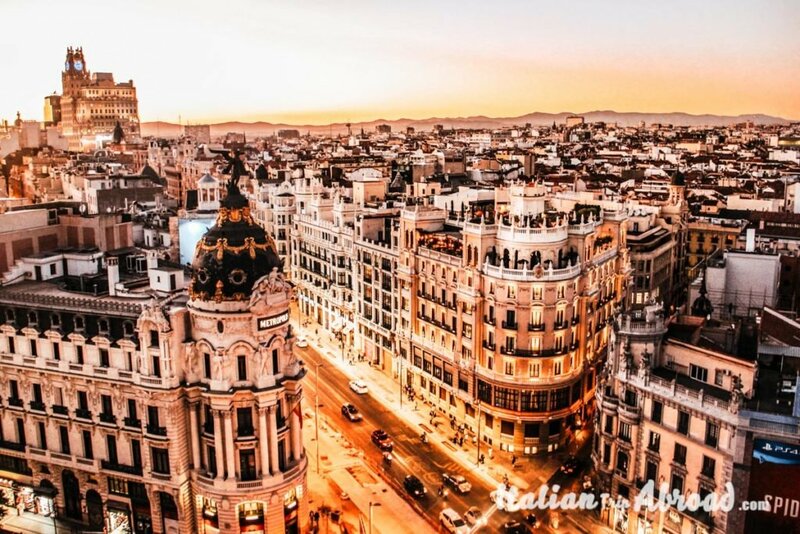 We are sure that this visit to Madrid in 3 days will give you some cute shot for Instagram of Madrid. You can visit Crystal Palace every day from 10 am until 10 pm. A popular tourist destination located in central Madrid, Spain at the western end of the Gran Vía. It features a monument to Miguel de Cervantes, writer of the world famous story of Don Quixote de la Mancha and his trusty squire, Sancho Panza. The monument is just stunning, there are no words to describe it. Alessia, which loves Spain and all the history, was so fascinated by this square. Madrid is the capital of Spain, and this square will tell you how much the Spanish people are proud. In your Madrid itinerary 3 days, you need to be ready to explore all those beautiful places around the city. As you know the Corrida is not anymore as before. Thanks this attractive but brutal sport is related to a few events. 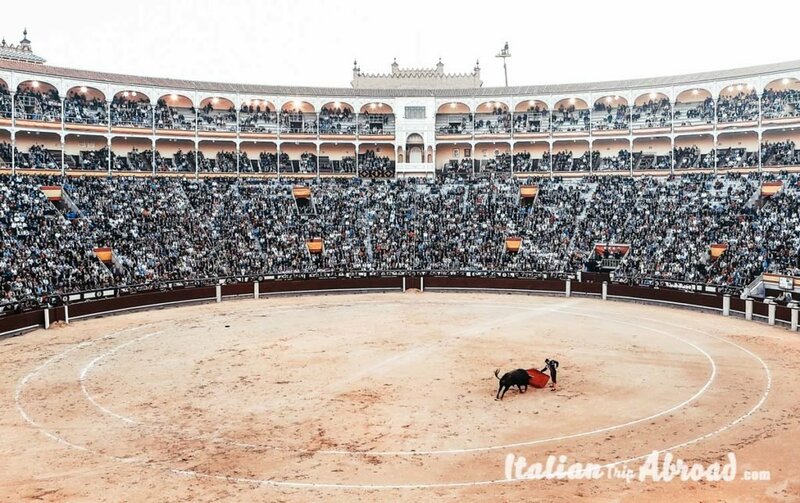 For those that don’t know about it, “ La Corrida” is where people are fighting with bulls. Plaza de Toros in Madrid it’s a huge arena where you need to pay a visit. It’s located close to the city center and the closest tube is Ventas, line 2 and 5. 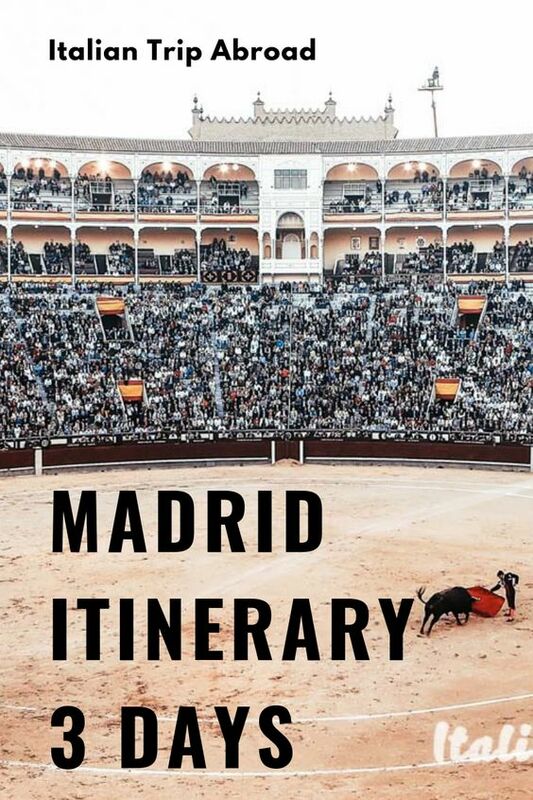 You will have the opportunity to do the Bullring tour with the audio guide only for 14.90 euro. Inside is amazing and it will explain to you all the history, which is really interesting. If you are planning a Madrid itinerary 7 days you should think about a day trip from Madrid to Toledo and Segovia. Segovia is located in the north of Madrid and Toledo in the south. By car, both of them are easy to reach. The trip is about 1h and 30 minutes-ish. You can reach the two locations with public transport, by bus or by train from the main train stations in Madrid. From the main train station in Madrid, Atocha, the largest in the city, you can reach many other locations in Spain. There is a high-speed train service that will link Madrid to Barcelona, Malaga, Sevilla, Zaragoza or even Valencia and Alicante. One of the easiest and most affordable ways to get from Madrid to Toledo is by train. There are trains departing from the Madrid Atocha Station every 30 minutes throughout the day. The same is true if you are coming back from Toledo to Madrid Atocha. The train from Madrid Puerta de Atocha usually takes 33 minutes. If you book your ticket in advance it is even better so you can avoid that the train is full or pick times. Toledo is a really cool place to visit. It is a small Spanish city where everything seems perfect, like in the movies. 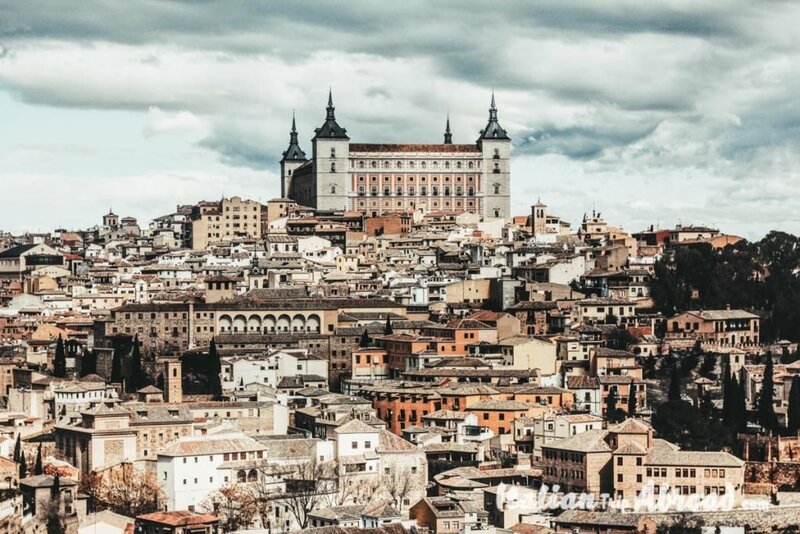 There are few things which you can’t miss during your time in Toledo. The journey from Madrid to Segovia by train is around half an hour and by car 1h and 20 minutes-ish. This is because of the high traffic on the highway. The easiest, quickest and cheapest way is always by train and by bus. There are offers from £4 with the bus and it takes 1h and 20 minutes, the same as the car. When you will plan your trip to the big Capital and thinking about how many days in Madrid, think about to organise a day trip from Madrid. You can’t miss visiting Segovia, a small and cozy village which you will love it.